Stonehenge is a megalithic monument located in southern England (it lies on Salisbury Plain, in Wiltshire). The earliest references to the name are in Anglo-Saxon ('Stanhenge') and Middle English ('Stanhenges') from 'stan' for stone and 'henge' meaning hanging or suspended. The tallest stone, one of the trilithons, is around 22 feet high. At present it is a tourist attraction and a place of pilgrimage for neo-druids. Stonehenge was constructed between 3000 and 1600 BC. The purpose of the site is as yet uncertain, although several different theories exist. The construction of the site can be considered a masterwork of engineering, considering the limited tools of the age in which it was built. Stonehenge is aligned to the sunrise at the summer solstice, or longest day of the year, around June 21. On that day, a person standing in the centre of Stonehenge will see the sun appear to rise over the Heelstone, a beautifully worn piece of sandstone around 16 feet high. Contrary to some fringe theories, there was no plan in World War I by the British government to demolish Stonehenge in order to make room for a longer runway for the nearby air-force base. The Royal Air Force was not established until April 1918 and the height of the stones posed no problem. Stonehenge currently receives a large number of visitors during the summer season. Furthermore, the druids insist on holding their ceremonies there as they have done for thousands of years; they were stopped by the government in the mid 1980s, but, after fifteen years, controlled access to Stonehenge was granted in 2000. However, the Druids had nothing to do with the construction of the stone rings; the site significantly predates druidism. A controversial plan to build a tunnel to carry the A303 road under Stonehenge was announced in January 2017. 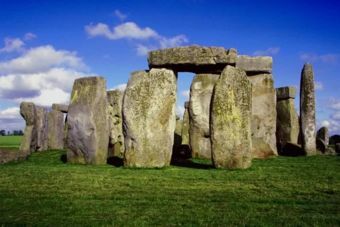 ↑ Dig pinpoints Stonehenge origins. This page was last modified on 29 April 2017, at 08:08.